CNN) — Deep down on the bottom of the Baltic Sea, Swedish treasure hunters think they have made the find of a lifetime. The problem is, they’re not exactly sure what it is they’ve uncovered. Out searching for shipwrecks at a secret location between Sweden and Finland, the deep-sea salvage company Ocean Explorer captured an incredible image more than 80 meters below the water’s surface. “I have been doing this for nearly 20 years so I have a seen a few objects on the bottom, but nothing like this,” said Lindberg. “We had been out for nine days and we were quite tired and we were on our way home, but we made a final run with a sonar fish and suddenly this thing turned up,” he continued. 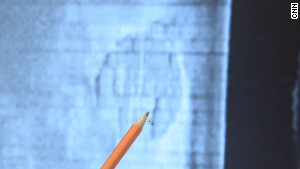 Using side-scan sonar, the team found a 60-meter diameter cylinder-shaped object, with a rigid tail 400 meters long. The imaging technique involves pulling a sonar “towfish” — that essentially looks sideways underwater – behind a boat, where it creates sound echoes to map the sea floor below. On another pass over the object, the sonar showed a second disc-like shape 200 meters away. Lindberg’s team believe they are too big to have fallen off a ship or be part of a wreck, but it’s anyone’s guess what could be down there. “We’ve heard lots of different kinds of explanations, from George Lucas’s spaceship — the Millennium Falcon — to ‘it’s some kind of plug to the inner world,’ like it should be hell down there or something. “But we won’t know until we have been down there,” said Lindberg. The Head of Archaeology at Sweden’s Maritime Museums, Andreas Olsson, admits he’s intrigued by the picture, but remains sceptical about what it could be. The reliability of one-side scan sonar images is one of his main concerns, making it difficult to determine if the object is a natural geological formation or something different altogether. “It all depends on the circumstances when you actually tow the [sonar] fish after the boat,” he said. “What are the temperature conditions, the wave conditions, how deep is your fish in relation to the sea bed etcetera and all those parameters also affects what kind of image you have in the end,” he explained. Even Lindberg agrees the image “isn’t the best it could be.” But his crew are still planning to return to the site in the calmer waters of spring to investigate their find. It’s a risky and expensive business, and not one that always pays off. British maritime historian, Professor Andrew Lambert, says the costs of recovery are now too high for most. It’s a problem Lindberg and his team are aware of. 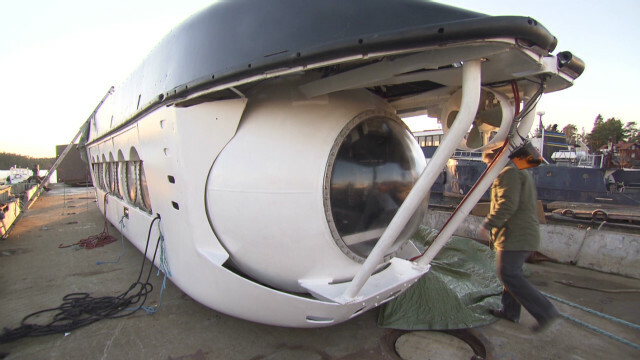 But even if the mystery object doesn’t contain retrievable treasure the site could still prove to be a gold mine for the Ocean Explorer team, with tourists and private investors paying to see it up-close, in a submarine. “The object itself is maybe not valuable in the sense of money it can be very interesting whatever it is, historical or a natural anomaly,” said Lindberg. In the North Atlantic, one American salvage company is also hoping to beat the odds. Odyssey Marine Exploration — a company made up of researchers, scientists, technicians and archaeologists — have at least 6,300 shipwrecks in their database that they are looking to find. Their latest discoveries include two British war-time shipwrecks off the coast of Ireland that could be laden with hundreds of tonnes of silver. Mark Gordon, president of Odyssey, says at least 100 ships on their watch-list are known to have values in excess of $50 million dollars. “When you think about the fact until the mid 20th century, the only way to transport wealth was on the oceans and a lot of ships were lost, it adds up to a formula where we have billions of dollars worth of interesting and valuable things on the sea floor,” he said. The lure of treasure has lead to an increasing number of discoveries in recent years. But one which doesn’t come without its dangers, warns Olsson. “I think recently we’re entering a time of a lot of discoveries,” he said of the technological advancements in finding shipwrecks. “The professional shipwreck discoverers are doing a great effort for cultural heritage management in the long run… what we don’t support is the action of actually taking up items and selling them,” he said. Last month we talked about the first four layers of thought, how to recognize them and live within them as a conscious and intentional practice. Let’s continue with the final three layers or levels of thought. Recognizing and understanding the steps or levels your thoughts move through may be helpful in managing them. And ultimately, choosing which layer you want to live in. As we do this, please don’t get locked into these layers as rigid lines. There is actually a fluidity and flow between them. As mentioned before, the flow from one layer of thought to the next is similar to watching the dawn of the day progress. For instance you can’t easily identify 6:30am, or 6:32am by looking at the sky. The sun rises and the sky flows from darkness into light. A moment ago it was pre-dawn. Now the sun is up and shining. This is the layer of thought where things really begin to get creative and quiet. This is where your consciousness begins to naturally, organically pull together many of the floating, curious pieces, combines them with the deeper, unconscious aspectsof you and begins to organize in such a way that you become much more conscious, focused and capable with your innate knowledge. This layer takes the curious interest of the fourth layer (the field of possibilities), and brings it to your mental workbench to organize and become more real as a possibility. This is done not with greater thought or concentration, but with a greater quietness, allowing, stillness and trust. This is where “I wonder where I would like to move?” unfolds into “Yes – Boise Idaho feels aligned, right, and good” with no effort or worry or figuring out. Living in this layer of thought is magical, although it isn’t magic. It is inspired. Many artists and writers create when in this layer. The creation process just flows and the book writes itself. This layer is similar to the great meditation where you find yourself easily sitting still for three hours and you think, “This is so good I don’t want get up.” This is the extremely quiet place where you begin to access deeper fields of awareness. You begin to think (or better yet exist) without thought. This occurs because you are in the higher fourth and fifth dimensional fields of knowledge. You begin to have conscious access to the greatness that you are. It’s in this space that you begin to have a sense of your powerfulness as a very positive word, your presence, what you are capable of. You touch your ability to think, and you do things without the influence or affect of others. This is where a thought is first thought. This is where the Rays of Creation truly begin to be used to arrange and rearrange all possibilities without any limitations. Although no thought is thought in words, everything comes effortlessly to you. It is in this layer of thought that much of the Level 3 work is practiced. You begin to play in a fifth dimensional time where time and space and gravity all operate differently than is understood in three-D. Alchemy here begins to be where you rearrange the frequencies of thought, change the harmonics of matter and you apply the elements of love in such a manner that, on your terms, you rearrange the molecules and begin to instantaneously produce in simultaneous time whatever you desire. Can you make that happen in this moment? The answer is “yes” – but not if the noise of the first three layers of thought are your habit. As you play at this and become more masterful, building more templates, more platforms to create from, more structures to live your life from, these fifth and sixth layers are where you live most of your day. You can then do what is necessary to allow more light to come into your body. You can build the unified field of consciousness, which becomes One with this field of possibilities. It is in this space that you begin to know your self as the Soul, fully integrated into the creative universal mind of Creator. Fully consciously, it is attainable at this minute, and you practice and live in the sixth layer of thought. The seventh layer of thought is not definable. There are no words available to describe it. It is where the thought-that-thought-you-into-existence and you think together. Now, if I was to skirt around the edges of that with some definitions, I could say that this layer is the place where you have a relationship with your Soul. This may be unimaginable to you. Your Soul has so much to do with the creation of you; Creator created you but your Soul also created you. And when your Soul, within the higher aspect of Creator, and you begin to think together in the unified field, you are no longer a third dimensional being. You are then beginning to play very consciously in the fifth, sixth, and seventh dimensions. Here, you are a citizen of those dimensions. At this point you won’t have a physical body as you know it now, but instead you will have a version of the Light body. It may be physical as well. The Light body is now becoming very available to each one of us, but to create that Light body, these expanded levels of light have to be brought into this form through the mental and emotional bodies. And those bodies are where we hold the third dimensional resistance, resentment, etc. That’s where the ugly thoughts, ugly emotions live. The predominant purpose of this Shift is for you to become conscious of being conscious, aware of being aware, integrating enough light into your mental and emotional body to the point where you don’t have those ugly thoughts and emotions; those reactions and resistances. When you can clear that energy from your emotional and mental bodies, you can begin to play at the sixth and seventh layer of thought. You will begin to change the density of your physicality from a carbon-dense body that does not absorb light to that of a crystalline nature of light that will allow a very significant transformation of your physical body. This possibility is available right now. It’s do-able right now, and this is the course that we are pursuing in all of this work right now. This is what begins to happen in that seventh layer of thought, but what I just described doesn’t adequately speak to what is possible. And we are getting closer to finding those words. In the meantime, I hope this has helped you gain a better sense of these layers of thought, and that I have created a structure upon which you can better stand and become more and more aware of your inner workings. As you do; as you become the quieter observer of your thoughts and patterns, the noise will lessen. A stillness of understanding and knowingness will prevail. And THAT is precisely where humanity is headed. You are at the head of the race. You are big and important and have much to contribute. And now is the time to know yourself. May you experience laughter and stillness on your journey Home. Jim Self is an author, international speaker, and teacher of the Tools for Mastering Alchemy. This work is in co-creation with Archangels, Ascended Masters and Teachers of Light. His website is: www.MasteringAlchemy.com or 775-851-8950 ~ Copyright: You may share this article with your friends as long it is kept whole and our website is included. Thank you. 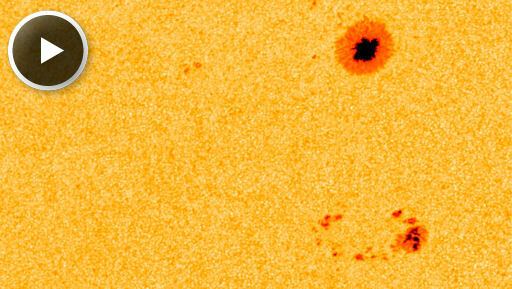 Does the magnetic architecture of this unusual spot harbor energy for strong flares? Magnetograms appear to show some mixing of polarities between the left and right halves of the ring, which could lead to explosive instabilities. So far, however, solar activity remains low. ScienceDaily (Jan. 31, 2012) — Manuka honey could help clear chronic wound infections and even prevent them from developing in the first place, according to a new study published in Microbiology.The findings provide further evidence for the clinical use of manuka honey to treat bacterial infections in the face of growing antibiotic resistance. Streptococcus pyogenes is a normal skin bacterium that is frequently associated with chronic (non-healing) wounds. Bacteria that infect wounds can clump together forming ‘biofilms’, which form a barrier to drugs and promotes chronic infection. Researchers at Cardiff Metropolitan University have shown that manuka honey can not only destroy fully-formed S. pyogenes biofilms in vitro but also prevent the bacteria initially binding to components of wound tissue. Honey has long been acknowledged for its antimicrobial properties. Traditional remedies containing honey were used in the topical treatment of wounds by diverse ancient civilisations. Manuka honey is derived from nectar collected by honey bees foraging on the manuka tree found growing in New Zealand and parts of Australia. It is included in modern licensed wound-care products around the world. Manuka honey has been reported to inhibit more than 80 species of bacteria, yet the antimicrobial properties of honey have not yet been fully exploited by modern medicine as its mechanisms of action are not fully understood. Wounds that are infected with S. pyogenes often fail to respond to treatment. This is largely due to the development of biofilms which may be difficult for antibiotics to penetrate — in addition to problems of antibiotic resistance. The results of the study showed that very small concentrations of honey prevented the start of biofilm development and that treating established biofilms grown in Petri dishes with honey for 2 hours killed up to 85% of bacteria within them. The Cardiff team are working towards providing molecular explanations for the antibacterial action of honey. The latest study reveals that honey can disrupt the interaction between S. pyogenes and the human protein fibronectin, which is displayed on the surface of damaged cells. “Molecules on the surface of the bacteria latch onto human fibronectin, anchoring the bacteria to the cell. This allows infection to proceed and biofilms to develop,” explained Dr Sarah Maddocks who led the study. “We found that honey reduced the expression of these bacterial surface proteins, inhibiting binding to human fibronectin, therefore making biofilm formation less likely. This is a feasible mechanism by which manuka honey minimizes the initiation of acute wound infections and also the establishment of chronic infections. Ongoing work in Dr Maddocks’ lab is investigating other wound-associated bacteria including Pseudomonas aeruginosa and meticillin-resistant Staphylococcus aureus (MRSA). Manuka honey has also been shown to be effective at killing these bacteria. “There is an urgent need to find innovative and effective ways of controlling wound infections that are unlikely to contribute to increased antimicrobial resistance. No instances of honey-resistant bacteria have been reported to date, or seem likely,” said Dr Maddocks. “Applying antibacterial agents directly to the skin to clear bacteria from wounds is cheaper than systemic antibiotics and may well complement antibiotic therapy in the future. This is significant as chronic wounds account for up to 4% of health care expenses in the developed world. According to the Alaska Volcano Observatory, the aviation color color code and the alert level of Cleveland Volcano was upgraded on Tuesday to “Orange” and “Watch” to reflect new satellite data indicating increased activity. The east central Aleutian Chain volcano, which sits 45 miles west of the community of Nikolski, has spent much of the past year teasing that it would erupt, and its status has alternated between “Yellow/Advisory” and the more serious “Orange/Watch” four times since July 2011. The AVO reports that the lava dome that had developed at Cleveland last year was mostly removed by a brief explosive episode at the end of December. But new satellite images indicate that a fresh lava dome,approximately 130 feet in diameter, has formed in the summit crater. There have been no explosions or ash emissions detected during the current lava eruption, but the AVO notes that it remains possible for intermittent, sudden explosions of blocks and ash to occur at any time, and ash clouds exceeding 20,000 feet above sea level may develop. Because Cleveland is not covered by real-time seismic sensors, such explosions and their associated ash clouds may go undetected in satellite imagery for hours. Read the latest from the AVO’s Cleveland status page, here, and read the bulletin announcing the new status upgrade from the U.S. Geological Survey, here. What were those bright, flare-like objects dropped from aerial red UFOs over Utah? No official explanation has been offered. With so many small video cams and cell phones that include cameras, it’s become more and more commonplace that people are videotaping weird things seen in the sky. And one of the latest comes from Utah. Last week, strange lights in the sky were reported, videotaped and posted online by folks in the American Fork, Utah, area. Three red lights appeared in the sky, hovered in formation for about 15 minutes and dropped bright, white-colored objects, reports ABC4.com. Chidester said there ended up being three red lights, and she saw something strange happen. A few miles away, Mike Galbraith was in a shopping center parking lot when he also saw the lights, which he captured on his cell phone camera. “I looked up and there were three red lights and then they started dropping what looked like flares or something bright was dropping straight down,” he said. “They looked like they were flying in formation perfectly together and then, whatever was dropping looked like it was burning real bright,” Galbraith added. Local airport and military officials report nothing unusual happened in the sky over Utah on the night in question, so the incident remains, for the time being, unidentified, in keeping with the definition of UFO: unidentified flying object. If you were outside today in Downtown Chicago — Any time after about 1030am CST — 1/30/2012 — chances are , you may have been exposed to NUCLEAR RADIOACTIVE FALLOUT from the steam that was vented by the Byron Illinois / Exelon Nuclear power plant. More specifically, aerosolized particulates of Tritium were in the clouds of steam released—- those clouds then blew down into Chicago area proper. As to whether people inhaled these particles — only time will tell now. Overlay the two maps above and you’ll see that ANYTHING vented from that Nuclear plant DID INDEED blow into Chicago proper. Tritium is an isotope of hydrogen, which allows it to readily bind tohydroxyl radicals, forming tritiated water (HTO), and to carbon atoms. Since tritium is a low energy beta emitter, it is not dangerous externally (its beta particles are unable to penetrate the skin), but it is a radiation hazard when inhaled, ingested via food or water, or absorbed through the skin. HTO has a short biological half-life in the human body of 7 to 14 days, which both reduces the total effects of single-incident ingestion and precludes long-term bioaccumulation of HTO from the environment. Tritium has leaked from 48 of 65 nuclear sites in the United States, detected in groundwater at levels exceeding the United States Environmental Protection Agency (EPA) drinking water standards by up to 375 times. Update 14:40UTC: Indeci still maintains the figures of 98 injured, 3 people homeless, 10 people in affected houses, 1 destroyed house and 2 damaged, however other reports give much higher damaged buildings estimates. An intensity of V was seen in Ica, meaning lower damage to be expected. The hypocenter was updated to Ml6.3, but the depth was 54km. (The epicenter was 47km SW of Ica). Update 13:40UTC: The reports from earlier have been confirmed that the cathedral in Ica had several blocks of the roof which fell down, luckily not killing anyone. Update 12:40UTC: Around 100 people have been injured, however most are not seriously injured with only 12 of these severely injured. Update 12:00UTC: The statistics remain the same as at 11.00 UTC – 96 people injured, at least 10 houses destroyed, power and water outages. There have been 96 people injured as a result, according to the preliminary damage information provided by Civil Defence authorities. Many houses have been damaged as a result of the earthquake and a number of homeless are expected. At least 10 houses have been deemed uninhabitable. Some sections of Ica are still without power and water. The wall of the third floor of a house located at the same intersection of the Piura and Chincha avenues near Ica collapsed and crashed into the center of the house after the earthquake in the morning. It did not have any cross bracing. For persons injured by the earthquake in Ica, the General Office of National Defense, Ministry of Health informed the Emergency Operations Center National INDECI that they have been evacuated to hospitals and health centers for immediate care. Staff of the National Police of Peru are currently in all the provinces of the Ica region, while the Civil Defense Office of the provincial and district municipalities are conducting an assessment and monitoring test in coordination with the Regional Directorate of INDECI in Ica. For its part, Ica regional authorities made ​​an assessment visit in the districts of Ocucaje and Santiago in order to determine damage assessment and needs analysis. INDECI boss, General Alfredo Espinoza Murgueytio, has travelled in the last hours to the city of Ica, to coordinate with the Regional Government authorities and assess the damage caused by the earthquake. It should be noted that the quake was also felt in the regions of Lima, Ayacucho, Huancavelica, Junin and Arequipa. Update 10:00UTC: In addition, many sectors of the city of Ica are still without electric service and several homes were badly damaged. Even a few structures that withstood the 2007 earthquake, now collapsed such as the cornice of St. Joseph Church and the old houses near Ica. We at earthquake-report.com believe that there will be significant losses discovered as day breaks. The number of injured is 70 and no deaths have been reported as yet. Power outages however are making information distribution difficult at the moment. Here is an interview with Gregg Braden concerning the changes that are happening at this time, including prophecies, ancient texts, magnetics, Schumann Resonance, the Great Shift of the Ages, etc., etc. etc.